On Taylor - Madam Hawke (RUBY) Fun Skirt and Tee, Penelope and Coco brogues with MAC neon orange lipstick. Yesterday afternoon it was uncharacteristically warm, even though its the end of summer! So Taylor and I decided it was the perfect opportunity to take a bike ride in the park, but of course being the girls that we are, we unable to pump up my tire and instead broke the pump!! Haha. 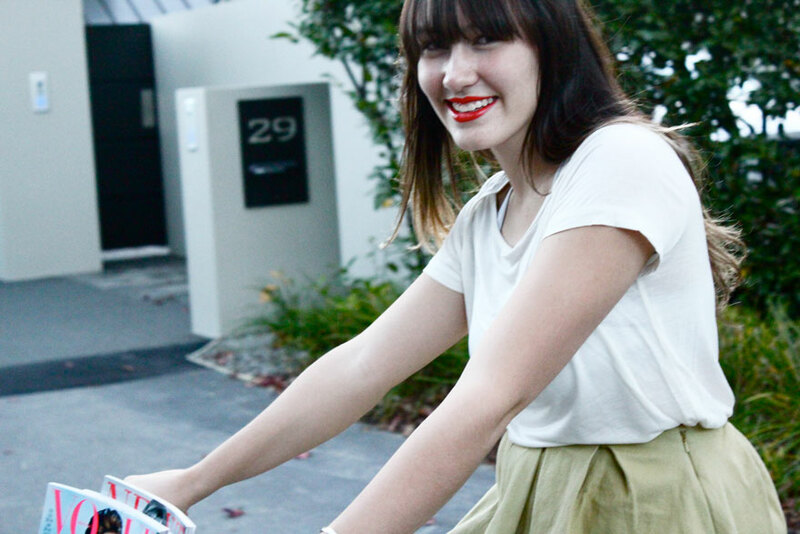 However Taylor still had her bike so we rode it to the end of my street and took a walk and photos in Milbrook reserve. It's so beautiful and tranquil down there. I love these outfits and all the pictures. There's something nostalgic and yet modern about them. looks like the two of you are having fun! the vogue in the bike basket is cute. thanks for your comment the other day. I've just posted a new one tonight :) more from LMFF. hope you girls have a good week. Hi sweeties!! You are both stunning!!! I just find your blog....I think it is very nice!!! Perhaps you'd like to follow each other? wow amazing pictures with very beautiful and adorable girls. This looks like an absolutely amazing day! Loved the Vogues on the basket. Looks like you had lots of fun!! Wow, these are stunning photos, and you are stunning girls! Love the cat pic. You guys are lovely! Beautiful ladies! Love the vintage vibe of the looks and the photos! ahahaha you guys look so happy and carefree :) gorgeous! Thanks for your comment! Love those looks and your blog. Do you want to follow each other? Thank you for the nice comment in my blog? Would you like to follow each other? I love the looks and the pictures are amazing! I am now a follower of your blog! i would love you to follow mine also? Fabulous photos! I love the outfits! I celebrate the good ideas i find here every time. Love the photos and the vintage vogue!! Stunning photos! I love the flirty skirts and I definitely need some orange lipstick!! Nice photos and great blog!!! The pictures that were deliberately blur are wat sets the mood for the day.